Jackson Durant (Warner Baxter) gets his kicks by defending men who are less than respectable in court. Fresh off of a brilliant courtroom win in the case of racketeer Tony Gazotti (Nat Pendleton), Jackson finds himself in hot water despite his success. Jackson’s law partners have lost their tolerance of his choice in clientele. Jackson’s fiance Sue (Martha Sleeper) also hates his clients, and she breaks off their engagement because he’s unwilling to stop defending mobsters and guilty criminals. While Jackson wallows in self-pity and drinks his time away, Sue becomes engaged to Tom Siddall (Phillips Holmes), who is then accused of murdering his ex-girlfriend, Mimi Montagne (Mae Clarke). Convinced of Tom’s innocence and unsure where else to turn, Sue asks Jackson – the man she just dumped for taking cases like this – to defend Tom and find out who really killed Mimi. 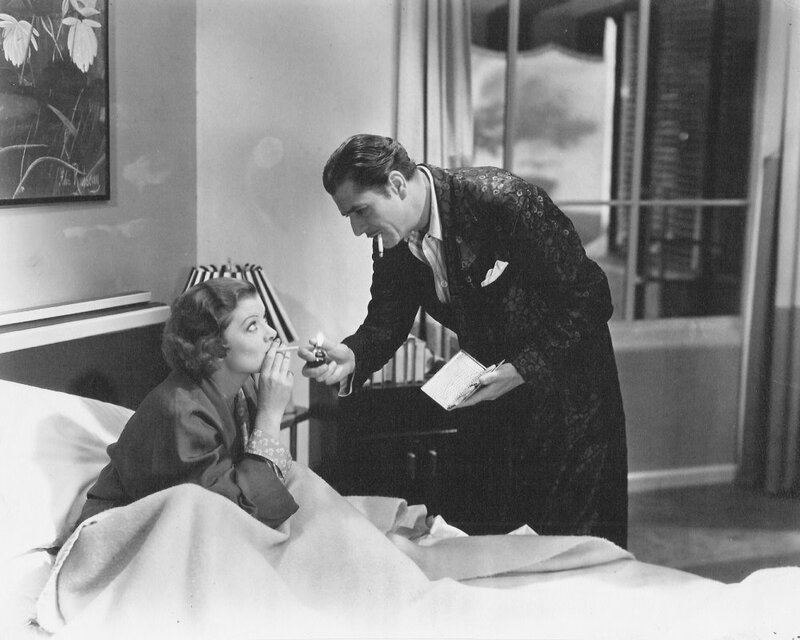 With the help of Mimi’s beautiful and sassy roommate Gertie (Myrna Loy) and new-found ally Tony, Jackson takes on the case and sets off to track down the culprit. Stories of the wrongly accused, especially those with a strong element of mystery, have no trouble winning me over. I’m a sucker for stories with plenty of twists, turns and sneaky characters. Penthouse is no exception. It starts out a bit slow, but once the story really gets moving about half an hour in, the viewer easily becomes immersed in the film. This initial interest is maintained through moments of both high drama and witty banter, effectively trapping the viewer into the story. To top it off, the performances in this film are wonderful. The characters are somewhat typical: a quirky non-detective doing detective work, a nosy lady and a silly butler at his side, a wrongly accused man, a gang of truly scary criminals who pose a threat to just about everyone. While conventional, these characters are still fun to watch, especially with such a great cast filling the roles. Warner Baxter and Martha Sleeper in particular have great tension as exes who are working toward the same goal (to get her new fiance out of jail, no less). And, of course, Myrna steals the show. Much like in The Thin Man series, which began the next year, Penthouse features Myrna as the sleuthing lady-friend of a quirky detective who wants her to stay out of trouble. The character of Gertie is no Nora and the chemistry between Loy and Baxter isn’t quite as good as that of Loy and Powell, but Penthouse is almost as enjoyable as that beloved comedy-mystery series. Though the story and characters don’t necessarily stand out in the sea of the genre, Penthouse isn’t quite as ultra-predictable as one would expect. The ending is expectedly happy, but all of the film’s plotlines are well-resolved. In general, the surprises that are tossed at the viewer are very effective. The quickly paced, snappy script also adds to the story’s appeal. 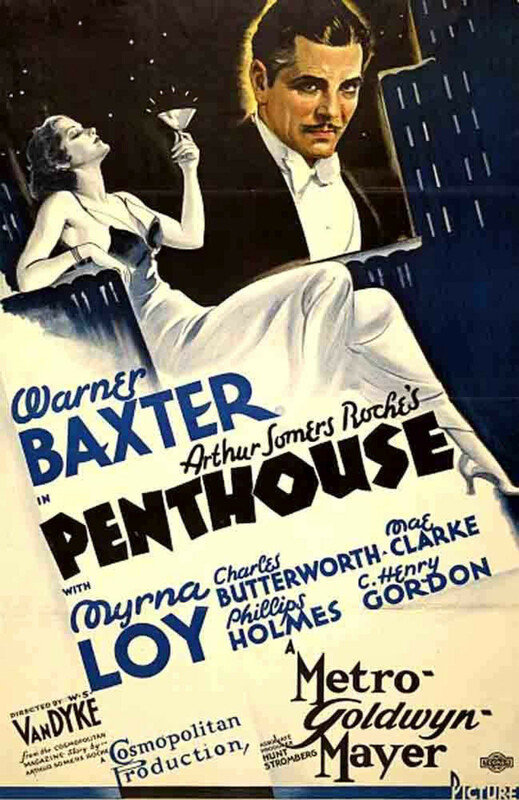 Though familiar, the story and characters of 1933’s Penthouse make for a thoroughly entertaining film.